A devoted servant of the Church and a symbol of the suffering Roman Catholic Church in China, His Excellency Most Reverend Archbishop Dominic TANG Yee-Ming, S.J., the Roman Catholic Archbishop of Canton in Guangzhou province, China, died of pneumonia on Tuesday, June 27, 1995 at 1:40 p.m. at St. Joseph Medical Center, Stamford, Connecticut, U.S.A. He was 87 years old. Born in Hong Kong in a devout Catholic family, Archbishop Tang entered the Jesuit novitiate in Spain in August 1930. He pursued his theological studies in Shanghai and was later ordained in 1941. His pastoral work expanded to a myriad of roles including parish priest, principal of a primary school and welfare work in Canton (Guangzhou) province. 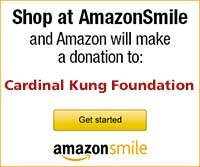 Archbishop was a founding advisor of the Cardinal Kung Foundation. During his visits each year, he spent much time advising the Foundation in its policy and programs, keeping it abreast of the development of the underground Church. He shared with us some of his plans and dreams for the loyal church. The Foundation is forever indebted to his wise counsel, support and encouragement. As symbols of the persecuted Roman Catholic Church in China, Archbishop and Cardinal Kung had a special bond. They are the only two Roman Catholic Bishops from Communist China who had the chance to live in the free world. They were both consecrated bishops after China turned Communist. They both were jailed in different parts of China for extended period, 22 and 30 years. Yet, by providence, they met again in 1990 in the United States after nearly 40 years of indescribable experience. Even more important, they were close friends who worked together for many years in Shanghai. Each May, for the last five years, Archbishop Tang would spend a week with Cardinal Kung in Stamford, Connecticut. Archbishop often commented that the Cardinal is his very dear friend of fifty years. In the 1940's, Archbishop Tang taught English in the Jesuit High School in Shanghai, where His Eminence, the then Father Kung, was the principal and a Latin teacher. Archbishop was very proud that, as a diocesan priest, Father Kung was appointed principal of two top Jesuit Schools. Archbishop treasured the memories of many weekends in China he had with Father Kung, bicycling to the parishes to assist in hearing confessions and other services. In 1949 after China turned Communist, Father Kung obediently accepted the episcopacy as the first national Bishop of Shanghai. When Archbishop was appointed Bishop of Canton in 1953, he traveled to Shanghai and sought counsel with Bishop Kung. Bishop Gustave Deswaziere, who consecrated Bishop Tang, said at the consecration: "By accepting the appointment from the Holy See in these difficult times, the new bishop was showing absolute obedience and a spirit of sacrifice." 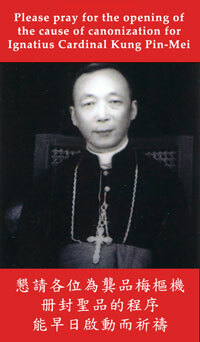 During the following years, Archbishop said that he often looked to Bishop Kung for his interpretation and reaction to the many new policies of the Communist government which terminated or restricted the activities of the Church. Handcuffed, thumbprinted and photographed, Archbishop Tang was arrested like a common criminal on February 5, 1958. The government charged him as "the most faithful running-dog of the reactionary Vatican." He stayed in jail for 22 years until his sudden release in 1981 when he was given permission to leave China for a cancer operation in Hong Kong. Archbishop Tang was never brought to trial, and therefore, was never convicted of any crime. Since his release, he had never shown any bitterness for his 22 years of imprisonment even though no apology was ever expressed by the Chinese government. The only official comment from the Chinese Government was that it was the leniency of the Government that the Archbishop was released. Leniency? After 22 years in jail without a trial? A stout defender of the suffering Roman Catholic Church in China, the Archbishop was a prisoner of conscience because of his allegiance to the Pope and because of his continued refusal to join the Chinese Catholic Patriotic Association. The Patriotic Association is established by an atheistic Chinese Communist Government. It rejects the Pope's authority and is not recognized by the Roman Pontiff. All Patriotic Association bishops are appointed by the Chinese Government and are ordained without the Pope's approval. The Roman Catholic Church is loyal to the Pope, and has been persecuted by the Chinese Communist government since 1949. These persecutions still continue today. The Roman Catholic Church is illegal in China and is commonly referred to as the underground (loyal, clandestine and suffering) Roman Catholic church. According to his memoirs, the 22 years of incarceration consisted of long periods of interrogation, a 7- year solitary confinement, permanent intense hunger and malnutrition. He was not allowed to receive letters, and was not given clothing or basic supplies. After his only pair of shoes worn out he went barefoot for the remaining 22 years. "In prison, I always asked God to grant me the grace to progress in virtue., e.g. humility and obedience....I obeyed only the regulations which did not conflict with the principles of my faith. I want to be gentle and kind to others, without resisting ill-treatment from others; when controlled and walked on, I did not complain. There are many opportunities for practicing virtue in prison." "When I was a seminarian, I learned to do God's will. God's will required me to practice virtue in prison. This was God's love for me." Archbishop Tang was permanently exiled by the Chinese government in June, 1981 when he was elevated to Archbishop by Pope John Paul II. The Chinese government considered this decision of the Pope an interference in the internal affairs of China. The Patriotic Association of Canton immediately announced that Archbishop Tang has been removed as the Bishop of Canton. Living in exile in Hong Kong, Archbishop Tang traveled extensively over the last 13 years, continuing his apostolate by visiting Chinese Catholics and many prelates in Japan, Southeast Asia, Australia, Europe, America and Canada. As a tireless advocate of the underground church, the Archbishop once confided in us, "Cardinal Kung and I are the only two bishops from the communist China living in the free world. Cardinal is 7 years older than I. He cannot travel easily. I must do the traveling for both of us, to bring the true situation of the persecuted church to the free world." In January 1995, Archbishop Tang fell ill with pneumonia in San Francisco. After a month of hospitalization, he recuperated at St. Ann's Home under the loving care of the Little Sister of the Poor. He was very insistent that he be present at Cardinal Kung's triple anniversary celebration. Archbishop said: "This is not only a joyous day for His Eminence, it is a very significant day for the entire loyal church in China. I must be there with His Eminence." Sister Lorraine, the Little Sister of the Poor, who nursed him to health expressed, "His Grace worked very hard to improve his health to convince his doctors that he was fit to travel. He was so excited that his health improved significantly in May." The Jesuit community sent an assistant and a nurse to accompany him. He arrived in Stamford on May 25th to participate in Cardinal Kung's triple anniversaries - 65th year of holy priesthood, 45th year as a bishop and 15th year as a Cardinal. Archbishop spent four very happy days living together with Cardinal Kung. He was very happy to see many old friends from Canada, Taiwan, and different parts of the United States. Sadly, on the morning of his scheduled departure, Archbishop was again ill with pneumonia, eventually proving fatal. I was privileged to be with him for the entire length of his hospitalization. He treasured life and was most positive even to the very end of his days. Many times, he said: "I have so much more work to do." He had friends by his bedside in the intensive care, planning and talking about the underground church. He was an inspiration to everyone. Soon after his admission to intensive care, the doctor, in the presence of the nurse supervisor and another nurse, asked him whether he would want a respirator if one day his breathing becomes difficult. His answer was simple and direct. "Yes, of course. I waited in jail for 22 years. I can wait a little longer." Two weeks later, his breathing was indeed getting difficult. The doctor confirmed with Archbishop again. Archbishop again replied, "yes". Cardinal visited him frequently. Forty minutes before Archbishop's death, Cardinal Kung entered his room. Standing at the head of his bed, with tears in his eyes, Cardinal bid farewell to his friend, giving him the final blessing. Archbishop's two nieces, a nurse, my wife Agnes, and myself were all with him. Archbishop had not responded for a couple of days. His mouth was open. We thought that the Archbishop might be unconscious, and might not be able to kiss the crucifix himself. After the blessings and prayers, we told Archbishop to please kiss the crucifix. We placed the crucifix gently to his lips. At the touch of his lips, Archbishop immediately closed his mouth and firmly kissed the crucifix three times in front of His Eminence! As we sensed the end was near, we observed the monitor closely. All of us were praying by his bed. His blood pressure and heartbeat kept dropping steadily. Finally, without a sign of struggle, His Excellency, Archbishop Dominic Tang, SJ went peacefully to His Lord. We immediately began praying to this new patron of the underground Church. During his illness in the intensive care, old friends, priests and religious sisters, including the Little Sisters of the Poor, Superiors of the Jesuit community from overseas, and throughout the United States visited him and prayed by his side. The hospital phone was kept busy with well wishes and prayers from his friends. Two days later, I had the honor to accompany Archbishop's body to San Francisco where he resided before traveling to Stamford, Connecticut. Cardinal Kung concelebrated a Mass of Resurrection with the tri-state Chinese clergy in Queens, New York on Saturday, July 1, 1995. On the same day in San Francisco, another Mass was celebrated by His Excellency Archbishop Quinn and concelebrated by two other bishops and about 80 priests. Other masses of resurrection were offered in Taiwan, Hong Kong, Macao and various underground dioceses in China. The Archbishop was laid to rest temporarily in an above ground crypt above the statue of St. Ignatius in the chapel at Santa Clara Mission Cemetery. One day when China is free, the body of Archbishop Tang, the first Chinese national bishop of Canton, will be brought back to his own Diocese and be finally laid to rest at the foot of the altar of his Cathedral in Canton. Archbishop, we thank you for your example of fidelity and for your incessant effort for the underground church. Please intercede for us.